FOLSOM, Calif., Feb. 11, 2019 /PRNewswire/ -- NewsBlaze and Word Matters! Blog announce the launch of a new daily mini news show World In Brief produced online by popular writer, editor, and blogger Ernest Dempsey. 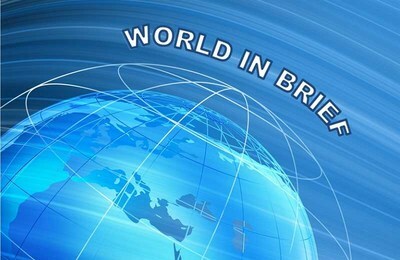 World In Brief is a short news show produced, recorded and shared daily by Ernest Dempsey at NewsBlaze and the popular website Word Matters. Each episode is 6 to 10 minutes long and includes 5 to 6 news stories from around the world presented in summarized form along with the presenter's brief comments or angle. The show also includes a history bite - a brief mention of what happened on that date in history. "People are generally short on time, yet they want to keep up with what's happening in the world. After a short beta test, with a select number of readers, and a few tweaks to the format, I decided to create this as a regular feature." Short news videos and blog posts are increasingly becoming popular. This is particularly true of independently produced newsy content by an individual or a small group. Unlike the hour-long shows of big, commercial media, independently produced news saves time, spares the audience the boredom of advertisements, and above all preserves the common man's voice. World In Brief fits this description well. Ernest Dempsey's take on news is conservative/libertarian. So his show has an eye for the events that relate to big government, censorship and freedom of speech, transparency and abuse of power, and other issues related to empowerment of the people. "Ernest has a long history with NewsBlaze, publishing his first story with us in August 2007. When he decided to start his World in Brief show, of course we supported him, and made a space on the front page." One feature of World In Brief that especially appeals to listeners is that stories missed from previous days are frequently included in the latest show. Whether it's health, technology, entertainment, or activism. Feedback from readers and viewers plays a part in the show's production. Viewers who missed listening to yesterday's news or from a few days ago can still expect to get the story in a new show. Each episode of World In Brief is also uploaded to the BitChute video streaming service, where it is archived permanently. Listeners can follow each new episode and listen to any past show at the link https://www.bitchute.com/channel/8S3yYu6WiUDJ/. For any questions, comments, or feedback, contact editor@ernestdempsey.com, or visit Word Matters! at https://www.ernestdempsey.com/.